The Sustainable Development Goals (SDGs), otherwise known as the Global Goals, are an agreed set of aspirations containing 17 goals and 169 targets covering many aspects of sustainable development. They include ending global poverty and hunger, improving human health and well-being and protection and restoration of marine and terrestrial ecosystems. The monitoring of the SDG remains one of the main challenges to their successful implementation globally. To overcome this challenge, earth observation and environmental sensing data have been identified as potential sources of consistent and long term data. 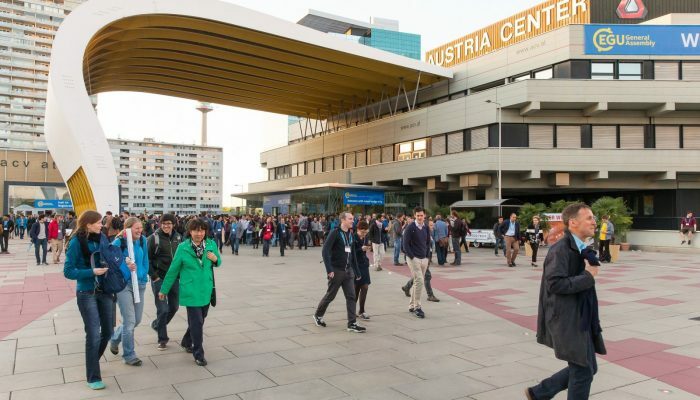 The EGU General Assembly, the largest conference in Geosciences in Europe with more 14000 attendees, is one of key transdisciplinary spaces to identify fresh research and networks led by scientist and professionals working indirectly/directly with SDGs monitoring. From among the great debates and talks on this year’s the EGU programme, the PICO session “Monitoring the Sustainable Development Goals with the huge Remote Sensing archives” aimed to highlight the research combining satellite data with household survey data to measure spatially distributed variables that can serve a basis for indicators of the SDG targets. In his contribution to the session, Alejandro introduced the relevance of his research to SDGs monitoring with a presentation titled “Big earth-observation data analytics for modelling pan-tropical land-use change trajectories for newly deforested areas”. Despite the challenge of presenting the results of the 1st year of his PhD in Geography in a very reduced time (just 2-min) and with a decent amount of attendees (around 30), Alejandro successfully informed his audience about the context, rationale, methodology and preliminary results of his research under the supervision of Dr. Mark Mulligan and Dr. Tom Smith (please see the full PDF of the presentation here). 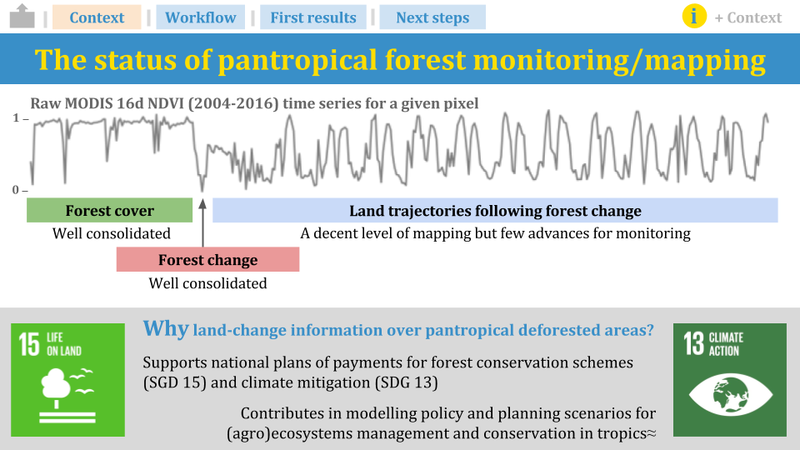 The presentation first highlighted the status of pantropical forest monitoring/mapping which,on the one hand consists of a well-consolidated research in forest cover and forest cover change monitoring but on the other hand, a lack of spatially-explicit mapping/monitoring of the follow-up land cover and land use after forest clearing (Figure 2). Fig 2. Alejandro’s slide introducing the context of pantropical forest monitoring/mapping. Alejandro presented the advances he had made with the research question “Are subsequent land cover and land use trajectories following deforestation measurable by time series analysis derived from long term EO data?”. 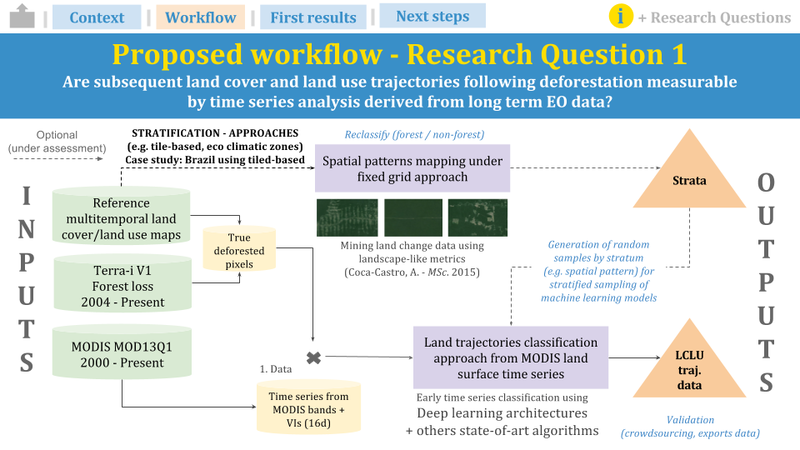 In a nutshell, the proposed method combines the existing deforestation datasets (reference sites of deforested areas) and multi-temporal land cover/land use data (labelled data) to train robust machine learning (ML) algorithms able to perform early time series classification using high-temporal land surface remote sensing archives (Figure 3). A set of experimental tests, performed in Brazil, were illustrated using reference multitemporal land cover/land use maps and MODIS MOD13Q1 16-day products (NDVI, EVI, blue, red, MIR and NIR bands) for training and evaluating state-of-art machine learning models for time series classification. Based on the emerging success of deep learning architectures such as Long-short term memory (LSTM) to perform time series classification i.e. early speech recognition, the presentation introduced results in the study area showing the potential usability of the LSTM algorithm for early land change classification from time series satellite data. Future work on the parametrization and optimization of deep learning models for land trajectories classification will be performed, including a fair comparison (model complexity, model performance, computing cost) against others state-of-art ML models. Fig 3. Alejandro’s slide illustrating the proposed workflow to address one of his PhD research questions. 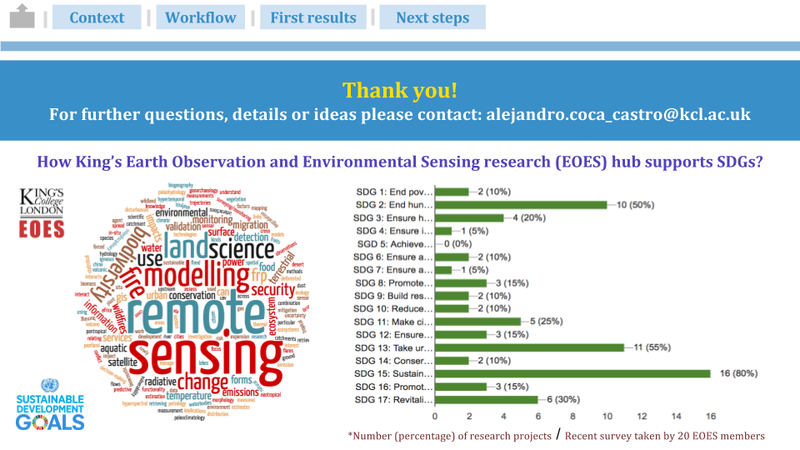 Finally, Alejandro also presented a summary of how King’s EOES member’s research supports SDGs, according to a recent internal survey taken last month (Figure 4). Fig 4. Alejandro’s slide showing how King’s EOES is supporting SDGs monitoring. Interested to know how Crowdsourcing and Big Data technologies were promoted in the EGU General Assembly as revolutionizing ways to collect/extract knowledge for data-driven analysis? Please see other two blog entries authored by Alejandro and posted in the King’s Geocomputation blog. The author is grateful to the Geography Department Small Grants and the P4GES: Can Paying for Global Ecosystem Services reduce poverty? project for providing funding for Alejandro’s successful attendance to the EGU General Assembly. Additionally, the author acknowledges the support of the partner institutions of his research, The International Center of Tropical Agriculture (CIAT) and the The School of Engineering and Management Vaud or the School of Business and Engineering (HEIG-VD). Revision of English version by Sarah Jones. This entry was posted in Conference reports, Earth Observation, Land change, SDGs and tagged Earth Observation, land change, MODIS, Remote sensing, Satellite, SDGs by Clemence De Butler. Bookmark the permalink.